Yes, unfortunately the French sent some smog across the channel in revenge for Agincourt, resulting in a nebular eclipse of the sun. 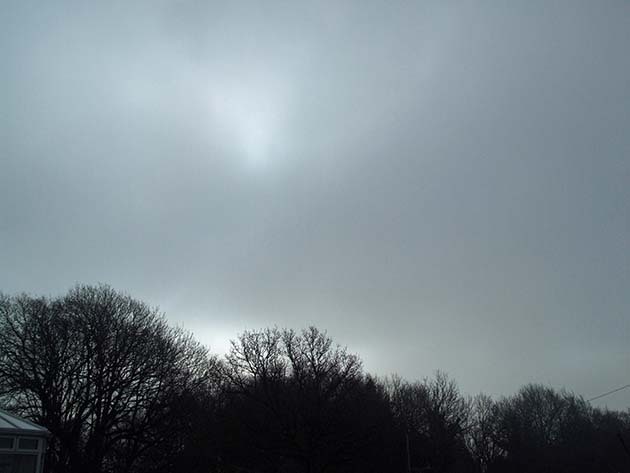 Still, I actually saw more than my daughter did sitting outside Greenwich Observatory, and it was a suitably apocalyptic morning as we did get some realistic gloom and chill, the mains water was mysteriously cut off and one of my neighbour’s sheep died in lambing. I forgot to ask him to check its omens before the knacker’s van arrived. 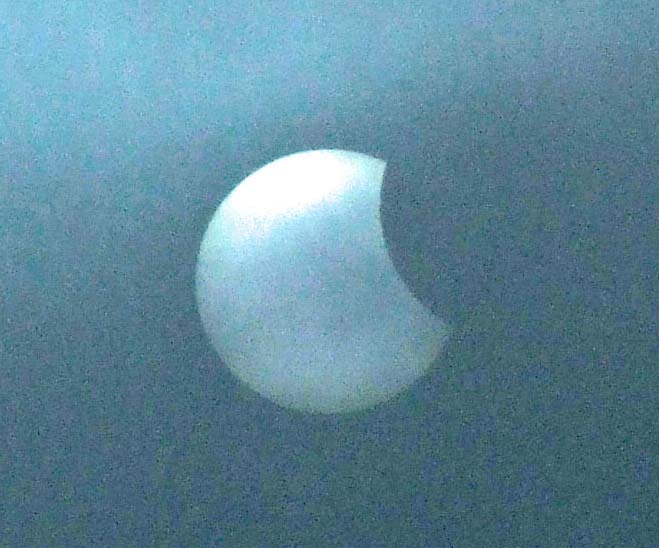 As soon as the eclipse had finished, the cloud cleared and the rest of the day was bright and sunny. Although I’ve seen a few partial eclipses over the years, I first pencilled in the next total eclipse in 1959, 40 years before it actually happened, after reading the date in The Boys Book of Astronomy. Conscious of the booking, I bagged the time off work at the start of 1999 before anyone else could, and motored down from Essex to South Devon to see it with my Australian pastor, a keen astronomer. In the event it was an overcast day, but in a way that made it even more awe-inspiring: I could imagine some simple farmer in times past suddenly finding it had gone dark without warning and being – as I was even with warning – terrified. If you’re interested I recorded my impressions soon after the event here. Tonight’s sunset was glorious, as if the sun were our to prove it’s not finished yet. Apparently, about two Fundamentalists in America predicted the end of the world, and the UK Independent printed the story as “‘Beginning of the end of the world’, say Christian pastors”. The usual cretinous crowd of anti-theists occupied most of the comments with their mantras on the stupidity of religion. A rather larger number of secular but even more stupid head-teachers forbade their children from going out to watch because of health and safety concerns – well yes, we all know several people who’ve gone blind during solar eclipses, don’t we? Several websites – including BioLogos I see – [update – the BioLogos link seems to be based on erroneous information. I beg their pardons!] are at pains to point out that the size and distance of our abnormally large moon, and so the possibility of total eclipses, is nothing to do with cosmic fine-tuning, but pure coincidence. I wonder how they know? But I have read one theorist who suggests that it was the phenomenon of eclipses that got astronomy, and consequently the other sciences, kick-started in ancient times. Like the aurora borealis (also unusually visible in the UK a night or two ago, though further north than here) eclipses are the cosmic events that shake us out of our sense of earthly security, apart from asteroids which shake us out of earthly security itself. So maybe we should be cautious about dismissing them as meaningless chance. 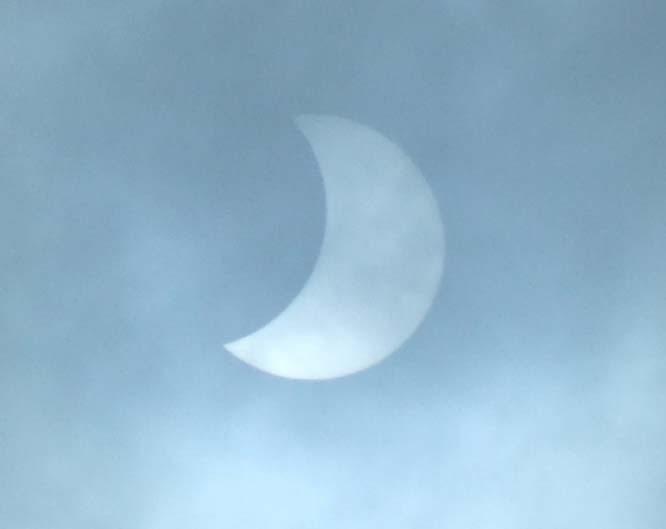 Anyway, the fact remains that unluckily for me both the big eclipses I’ve experienced have been swathed in cloud. But I’m told there is another one due here in only seventy-five years time. See you there. Menwhile, here’s the classic Yes track And You and I, which begins with a Steve Howec piece called Eclipse – much to be preferred to the Klaus Nomi song on the same theme, which carries the danger of making your eyes water. There were a couple Chinese astronomers/mathematicians from long ago that lost their heads (literally) for failing to foresee or forewarn their patron emperor about an eclipse that then caught them all by surprise. I imagine their successors must have been extra vigilant! …don’t forget to carry that one … check over the figures a half a dozen times … have your friends check them over too! Glad you got to enjoy it all on that side of the puddle. We were all left in the dark (of the more ordinary sort) over here. Well, it seems even ancient Chinese science was self-correcting, so it’s not unique to the West. I believe you have a good one due in a few years time. Perhaps I can persuade my daughter to move back to NY. I took a half decent photo of a total lunar eclipse a few months ago with my big zoom point and shoot, but you have to join Facebook and friend me to see it. Some ignorant BBC newsgirl could only think of playing “Tital Eclipse of the Heart” in her reportage, when (as we’ve already shown) there are far more suitable accompaniments. This one is very suitable too. I couldn’t find BioLogos’ claim about the coincidence. Welcome back, Bilbo – woops, I can’t find it now either. Looks like I followed a bum link which wasn’t actually to BioLogos. My apologies to them – full retraction. We noticed in Texas that the sun appeared for the first time in a couple of weeks about the same time it disappeared over there, for which of course there is an appropriate Beatles song.